If internet users search for something on the search engine, the first thing to see is the title tag. For this reason, it is important for you to pay more attention to this tag. Title tags are the main elements of a website in the form of text that is located between codes. This tag contains the title of a page and describes the contents of the page. The page title will provide information about what was discussed on the page. In addition, this tag is not only useful for readers, but also for search engines. Why is Title Tag Important for SEO? The title tag will be used by the search engine as the page title in SERP (Search Engine Results Pages). This tag can also affect the position of the website in search engines. Why so? Below will be explained 2 reasons that can affect the ranking of a website. Title tags serve to inform search engines about what is written on a page. Search engines will analyze the relationship between these tags and existing content. The relevance level of a page will greatly affect the position of the website. This is done to provide the right information to information seekers as desired. In accordance with the location in the first row of the snippet, this tag will be seen first before the user sees the description. Therefore, the tag will greatly affect the click through rate, which is a comparison between the number of clicks and the number of views. If you want to get a large number of clicks on the search engine, make a title tag or page title effectively. This tag has a significant influence on the reader. Because whether the reader wants to open a page or not, can see it through this tag. This tag will be used and found in several places, including the following. This tag is found in the bar at the top of the web browser that shows the title of the website page. In addition to the bar, this tag will also be used as the title of the site stored in the web browser bookmark. Title tags will also be used by search engines on the search results page (SERP). This tag will be in the first row of each snippet. As explained above, this tag has an important role in search engine optimization. The tag will affect the number of clicks on a website in the SERP. Social media is also one of the places to find this tag. How can this be found on social media? If the page on a website is shared to social media, the title tag will be used as the title. Then, how to make it correctly. The following will explain about 5 things that need attention. The first thing to do is to make a title tag that has relevance to the content created. Title tags must be made accurately. This means that this tag must be descriptive, explaining what is being written on the page. Don't make it not at all describe the contents of the writing. Because search engines will see the relevance of this tag, which will also determine the position of your website. Keyword or keyword is the text that will be used to do search engine optimization. Keywords can be found on various website elements. One of them is the title tag. Put the keywords that you are targeting on a page into this tag. You can enter primary and secondary keywords into this tag. Provided that these keywords must have relevance to the contents of the page created. Don't use irrelevant keywords. The best tips for optimizing keywords in the title tag is to put it at the beginning. Keyword really needs to be used on title tags, but use it naturally, don't overdo it (keyword stuffing). Keyword stuffing is a spam action. This is not liked by Google. For that, avoid writing excessive keywords on the title tag. Through the Matt Cutts blog it is said to avoid keyword stuffing. If this is done on a website, consequently the website can be banned and out of the google index. A good title tag is one that is fishing or inviting, which can make the reader click. This will affect the click through rate. Enter words like "newest", "easy", "complete", etc. that can make the reader want to open it. There is no title tag that is made the same on every page. Google said through the search engine optimization starter guide he made, that ideally each page has a unique title tag (different). This will help Google to differentiate the pages on your website with other pages. The five tips mentioned above I think are enough to make an effective title tag. In essence, make it for the benefit of the reader too. Not only for search engines. 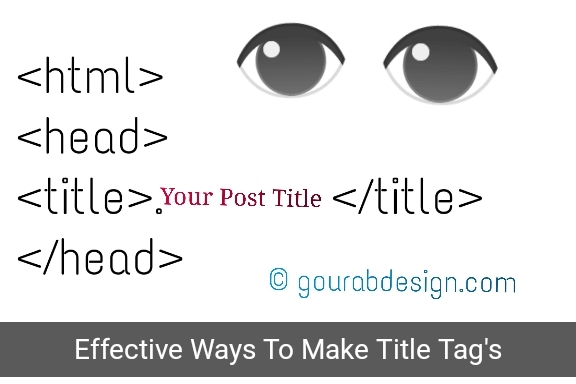 That's enough of gourab about Effective Ways To Make Title Tags On Blogs Website helpful?. So keep sharing this post on social media. Thank you.